Sun., 12 May - Sat., 15 Jun. Thu., 20 Jun. - Thu., 27 Jun. Mon., 3 Jun. - Mon., 3 Jun. Fri., 14 Jun. - Sun., 16 Jun. Mon., 28 Oct. - Thu., 7 Nov.
Fri., 28 Jun. - Mon., 1 Jul. See all 361 properties in Jean Lesage Intl. 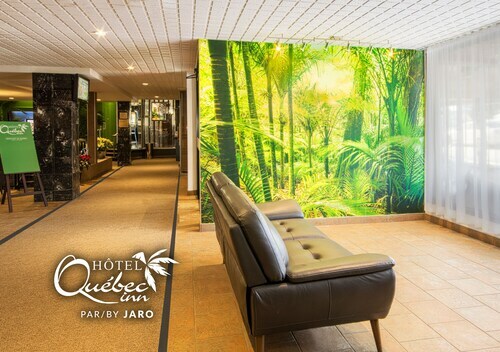 Situated near the airport, this eco-friendly hotel is within 6 mi (10 km) of Laurier Quebec, Aquarium du Québec, and Laval University. PEPS and Parliament Building are also within 9 mi (15 km). 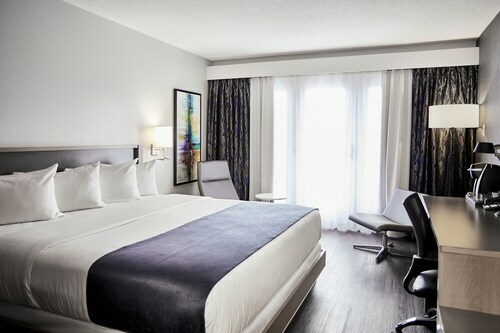 Situated near the airport, this eco-friendly hotel is within a 10-minute walk of Carie Factory Amusement Center and Recreofun Amusement Centre. Club de Golf L'Albatros Ste Foy and Metropolitan Golf Club are also within 3 mi (5 km). Situated near the airport, this hotel is within 1 mi (2 km) of Carie Factory Amusement Center and Recreofun Amusement Centre. Laurier Quebec and Aquarium du Québec are also within 6 mi (10 km). 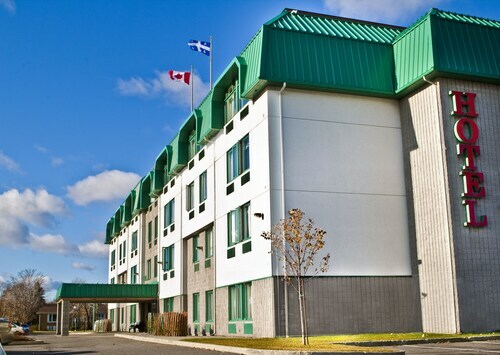 Located in the heart of L'Ancienne-Lorette, this golf hotel is within a 5-minute walk of Carie Factory Amusement Center and Recreofun Amusement Centre. Laval University and Laurier Quebec are also within 6 mi (10 km). 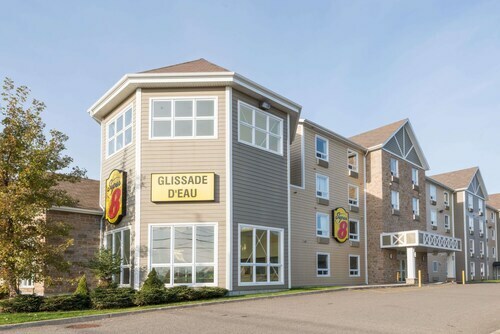 This family-friendly Quebec hotel is located near the airport, 1.2 mi (2 km) from Club de Golf L'Albatros Ste Foy, and within 6 mi (10 km) of Metropolitan Golf Club and Laurier Quebec. Parc de la Plage-Jacques-Cartier is 4.8 mi (7.8 km) away. 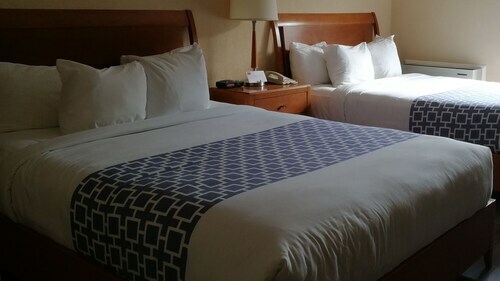 Situated near the airport, this hotel is within 1 mi (2 km) of Carie Factory Amusement Center and Recreofun Amusement Centre. Base de plein air de Sainte-Foy and Metropolitan Golf Club are also within 6 mi (10 km). 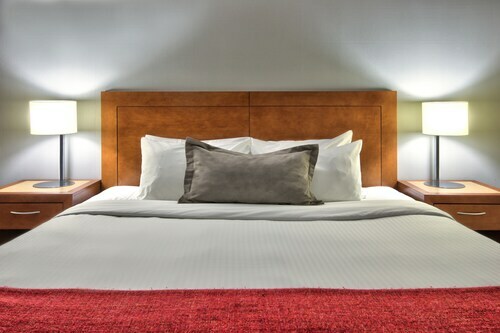 Situated near the airport, this hotel is within a 10-minute walk of Recreofun Amusement Centre and Carie Factory Amusement Center. Laurier Quebec and Aquarium du Québec are also within 6 mi (10 km). Situated near the airport, this hotel is within a 10-minute walk of Carie Factory Amusement Center and Recreofun Amusement Centre. Laval University and Laurier Quebec are also within 6 mi (10 km). Question : What is the cheapest date to fly to Quebec? Answer : As of Apr 22nd, the best day for booking to Quebec (YQB) is May 12th. A ticket will run you $393, which is 19% below the average price to book the same route. Question : How much is a plane ticket to Quebec (YQB) from Halifax (YHZ)? Answer : Prices vary from $393 to $907. Booking far in advance can usually help you get the cheapest rate. Prices tend to be better the further out you book. Question : What is the cheapest airline flying from Halifax to Quebec? Answer : Prices are hitting as high as $907 over the next three months when flying to YQB from YHZ. Check out Air Canada, as they have been booking customers at just $393. Answer : The cheapest day to fly from Halifax to Quebec is on Tuesday. If you would like to save a little money on your next getaway look for flights on Tuesday. Question : How long do most people stay on their visit to Quebec on average? Answer : Of course, you're not most people, but if you were, you'd stay around one week. Question : Which airline has the least delays from Halifax to Quebec? Answer : Booking with Jazz means you will arrive to Quebec pretty close to the time your ticket states. In fact, this airline has a 100% average for getting there on time. Of course, it never hurts to be prepared. If you’re on ExpressJet, be sure to sign up for the delay notifications to stay up to date with your flight’s status. Answer : You sure can and you may save yourself some money by changing it. The cheapest day to fly in May is Tuesday. Flexibility is key when booking travel plans in order to keep costs down.